Nick Newman, the Lead Pastor at Propel, leads a thriving church that was transitioning out of 'church plant' phase into an established local church. 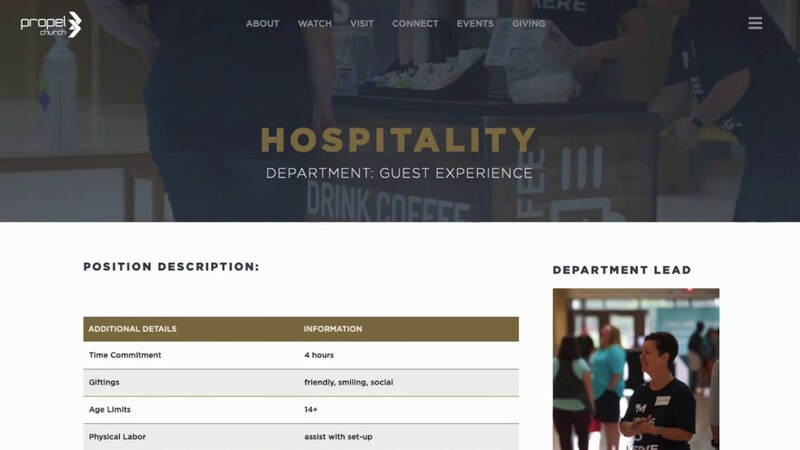 He needed a website that accurately reflected their image, their recent rebrand and focused on visitors while providing a hub for members and guests to find relevant info announced from the stage. We tailor made a website that did all of the above and more! Fun fact: this site has the most custom code of any site we've ever made! Props to Propel Church for having ridiculously solid branding guidelines in place. It let us jump right in and get to work. Our Favorite Part: The church hub and grid layouts. Propel Church wanted their dream team opportunities to be more than a checkbox on a form. We created a custom post type that makes it simple to add every position in the church by department. They add a new position, fill in the appropriate fields and everything shows up on the serve page (which is filterable by dept). Propel wants to be highly intentional with next steps given from the stage. To accommodate the continuity and simplicity they were striving for we created a 'hub' of sorts. This means that they only give one URL for all their next steps mentioned on Sunday Morning. Adding a new "hub card" is super easy and they can be ordered and featured by what is most important.